In this modern age of high tech gadgets, it is easy to take the technology around us for granted. If we look at the world around us as if we have never seen it before, it would be impossible not to be filled with awe and wonder. In this article, I will tell you the story behind one of the most important technological inventions of modern times - wireless communication. I will also describe some of my own experiments with high voltage spark transmitters and coherers! But before I talk about those, a little background is necessary to appreciate how they work. We’ll have to step into the shoes of the early pioneers in the field of electricity and see the world in a completely different way! After reading the story behind the discovery of electromagnetic waves, I wanted to make my own coherer. The amazing thing about the coherer is how simple it is. Why it works is also mysterious. It seems the electromagnetic waves somehow magnetize the filings, and they get closer to each other. I built my coherer inside a vinyl tube with iron filings between two ¼” bolts. I noticed that a very small amount of filings is required between the bolts for the coherer to work. Also, the performance of the coherer depends a lot on the gap between the bolts. I adjust the gap by first pushing the bolts until my multimeter (in continuity checking mode) beeps. Then, I pull the bolts out just a little until it stops beeping. That seems to be the perfect gap. Normally, the resistance between the two bolts will be very high - in megaohms. When the coherer detects electromagnetic waves, the resistance drops to 10-20 ohms. Normally the coherer will stay in this state of low resistance, and you have to tap it to decohere it. I am thinking about making an automatic tapping mechanism with an electromagnet. To test my coherer, I used a piezoelectric stove lighter. The electric spark created by the lighter was able to trigger the coherer, but it was not very reliable. So, I decided to build a better spark transmitter. I went to a junkyard and salvaged an ignition coil from a car. An ignition coil is a step-up transformer which converts 12V (from the car’s battery) to 20,000V-30,000V. This high voltage is sent to the spark plug to create sparks. There are different kinds of ignition coils. 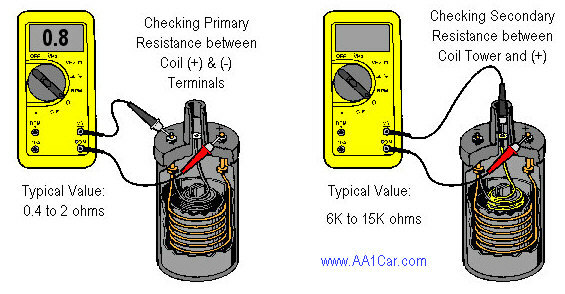 To identify the coils, you could measure the resistance on the primary and secondary coils. The primary coil should have a very low resistance in the range of 0.4 to 2 ohms, and the secondary should have high resistance in the range of 6K to 15K ohms. To test the coil, I connected a 9V battery to the coil’s primary. That was enough to create a spark on the secondary coil. When I told my dad about it, he shared his wisdom on how a car’s ignition system works, and said that I could improve the sparks if I add a capacitor across the contact point. In a car’s ignition system, there is a capacitor (aka condenser) across the contact breaker. This capacitor absorbs the back-EMF generated by the ignition coil, and reduces arcing on the primary side. This has two benefits. The first is that it improves the life of the contact breaker by reducing burning, and the second benefit is that it results in more intense sparks on the secondary. This is because the magnetic field collapses quicker when the capacitor absorbs the transient back-EMF generated on the primary side, and this increases the induced EMF on the secondary. So, I looked around in my workspace for a capacitor with a high enough voltage rating, but didn’t find any. Then, I got an idea while watching BBC’s “Shock and Awe: The Story of Electricity” presented by Jim Al-Khalili). In this show, they described how a Dutch scientist by the name of Pieter van Musschenbroek discovered how to store electricity. Before Musschenbroek’s discovery, people could generate electricity with devices like the Hauksbee generator, but did not know how to store it. In those days, people believed that electricity was like an invisible fluid. Using this analogy, Musschenbroek thought that if electricity is like a fluid, it should be possible to store it in a jar, just like we store water! So, he filled a jar with water, and used that to store electricity. He made what’s called a Leiden (or Leyden) jar (named after a Dutch town named Leiden). 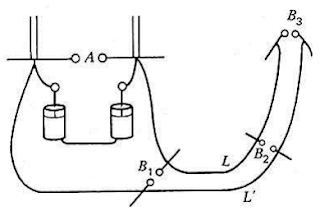 The Leyden jar was the first capacitor. I made my own Leyden jar in a bottle filled with salt water. I hammered a nail through the cap and wrapped aluminum foil on the outside. I connected this Leyden jar across my contact point. To my surprise, it actually reduced sparking on the primary side, and made the sparks on the secondary a lot more intense! Later, I designed an ignition coil driver circuit using a 555 timer for continuous sparks. After a lot of trial and error, and blowing several 555s, this circuit seems to be working reliably. You could adjust the potentiometers to change the 555’s output waveform, and this also changes the quality of the sparks. I have also tried connecting two ignition coils (in reverse-parallel configuration) to increase the output voltage. Based on the length of the spark gap and the dielectric breakdown voltage of air, I estimated the voltage to be somewhere around 60,000V! Be very careful when doing these experiments. Contrary to what you may want to believe, 60kV shocks don’t exactly feel pleasant (words of experience). I got lucky. Seriously, be very careful when working with high voltages. Carelessness could be fatal. Don’t get close to the spark gap or to any antenna connected to the transmitter. This transmitter can reliably trigger the coherer from a distance. I’m now thinking of ways to extend the range. Back in the day, when spark-transmitters were actually used for communication, people realized that adding a high voltage capacitor on the coil’s secondary could increase the gap current by orders of magnitude without changing the transmitter input power. See “How Spark Transmitter’s Work” by Hal Kennedy. A tuning coil and capacitor could be added to the ignition coil’s secondary to form a tuned circuit. When the capacitor is fully charged, it will discharge through the tuning coil and spark gap which will cause the capacitor and tuning coil to resonate at their resonant frequency. This will reduce the bandwidth of the electromagnetic waves created from the sparks and increase the range of the transmissions. By the way, when you have high voltage at your disposal, don’t miss the opportunity to make a Jacbob’s ladder, just like Dr. Frankenstein! There is a charm in rediscovering the past. Nice job, Ashish! And yes, when the receiver is equipped with an electromagnetic "telephone bell" the backstroke of the hammer can be used to hit the coherer as a "de-coherer". I also seem to remember reading that nickel filings worked better... but maybe not. Dec 24th is also the anniversary of Fessenden's Dec 24th 1906 Christmas Eve broadcast.